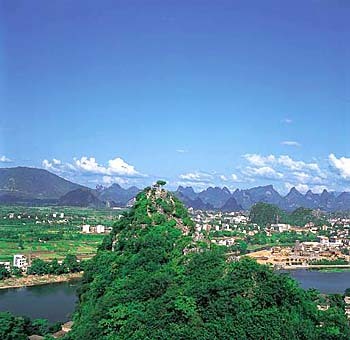 Guilin is in the northeastern corner of the Guangxi Zhuang Autonomous Region. It just sits on the west bank of the Li River, covering an area of 2,000 square km, with a population of 1.2 million. Major nationalities living in the cities include Han, Zhuang, Miao, Yao and Dong. Guilin has a history of more than 2,000 years. It is famous in the world for its green hills, clear water, fantastic caves and spectacular rocks. It has typical karst topography. Scientists believe that Guilin was an ocean between 370-325 million years ago. Between 200-180 million years ago, because of changes in the earths crust, the bottom of the ocean rose up and became land. Over subsequent centuries, the erosion effect gave rise to a myriad of eerie-looking peaks, underground rivers and caves. The hills and pinnacles in Guilin, gifted by nature, rise sharply from the ground in many different shapes. Diecai Hill, Fubo Hill, Duxiu Peak, Nanxi Hill, Crescent Hill and Putuo Hill are the biggest attraction for tourists when they make a tour of the city. 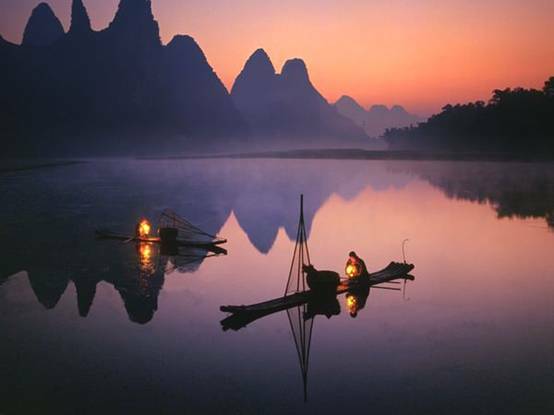 The Li River is in the region of Guilin. Elephant Hill, Chuanshan Hill, Pagoda Hill, Qifengzhen Peak Forest, Crown Cave, Painted Cliff, Xingping Town and Green Lotus Peak are the extraordinary scenic spots along the river. 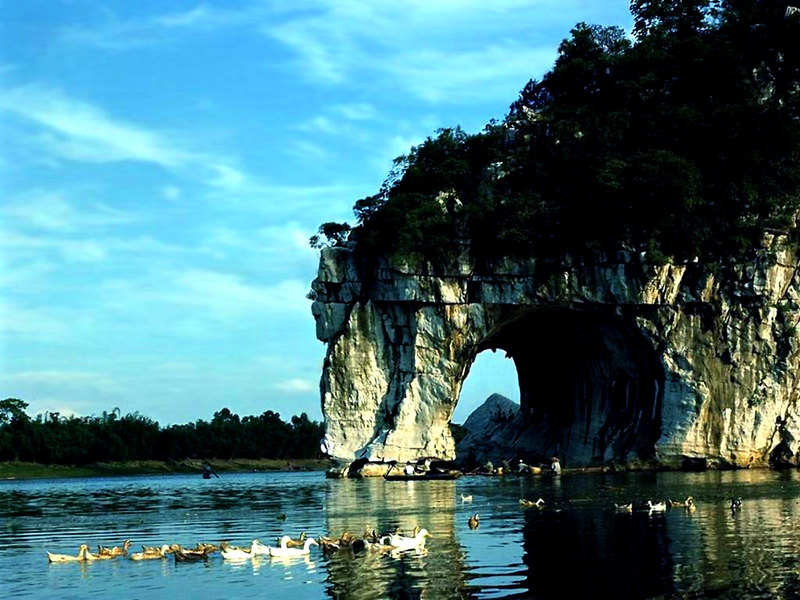 Grotesque caves can be found in all the Guilin hills. 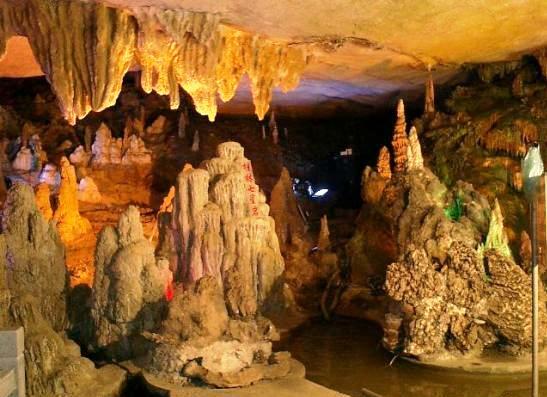 Reed Flute cave, Seven-Star Cave and Chuanshan Hill are honored as Palaces of Natures Art. Stalagmites in the caves present colorful pictures. Linking the waters of the Xiang and Li Rivers, the Ling Canal in Xingan County, north of Guilin, is a great ancient water conservancy project in Chinese history. It was built over 2000 years ago during the reign of the First Emperor of the Qin Dynasty. The first of these is from downtown Guilin where you board the cruiser to Huangniu Xia (valley). As soon as you leave the landing stage you will begin to enjoy the natural wonder and local customs. Upon reaching Huangniu Xia (valley) the cruise enters upon the second section. This part is the very essence of Li River. The gorgeous mountains and the crystal water together with the romantic legends are certain to impress you. Shuiluo Village marks the beginning of the third and final section that ends at Yangshuo. Along this stretch of the river you pass through pastoral scenes unchanged for generations as the banks are lined with quaint fishing villages, farmland and bamboo groves. Located at the confluence of the Taohua (Peach Blossom) River and the Li River, Elephant Trunk Hill is too famous to be missed. 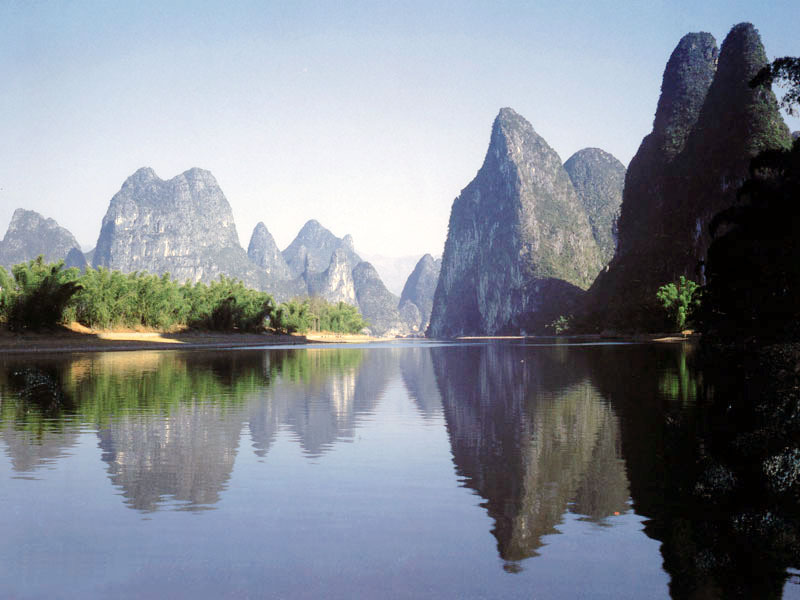 It is said to be the symbol of Guilin scenery and also a highlight in Li River. Diecai Hill, also named Gui Hill, famous for its amazing scenery and stone caving, is one of the most attractive scenery in Guilin. The easiness for climbing makes great contribution to its popularity among visitors. Seven-Star Park is located on the bank of Li River, crossed by Xiaodong River. The park got its name owing to seven peaks looking like Charles Wain. This is the largest and most popular park in Guilin with the longest history. Hills, rivers, caves and stones are highlights of this park. Reed Flute Cave is 5 kilometers (3miles) from downtown in northwest suburb of Guilin. Here the scenery is focused on caves, and their rural setting. Within the cave there are enchanting stalagmites, stone pillars, stele, stone curtains and stone flowers. Guilin enjoys its fame for its exotic dishes and the sights of dogs, birds, turtles, snakes and other weird animals in their cages at restaurant. Dont be afraid though, if you are not feeling extremely intrepid, there are plenty of tasty options for those who prefer their regular food. Lipu Taro looped Meat: This famous dish is made of taro from Lipu (104km south of Guilin) combined with streaky pork with skin, pepper, mashed onion, preserved bean-curd of Guilin, cooking wine, sugar etc. The final product is golden and aromatic with taros scent. 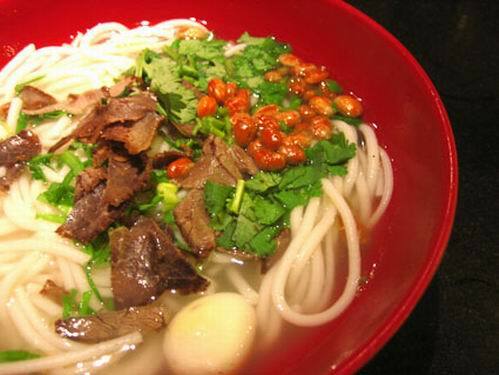 The Guilin Rice Noodle: The Guilin rice noodle is the most popular local snack and the residents favorite. The rice noodle is prepared with gravy, fried peanuts or soybeans, chopped scallions and slices of beef. Oil-tea: Originated in the areas of ethnic group like Dong and Yao, oil tea was first created to ward off the moisture entering peoples body and keep warm. People there boil the tea with ginger, scallion and serve with fried rice, peanut. Now the habit has been widely spread in North Guangxi, and the most famous one is Gong Cheng oil-tea. 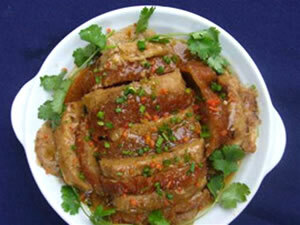 Guilin sanhua alcohol, Guilin fermented bean curd and Guilin chili sauce are considered to be Guilins three treasures, and are top choices with visitors to the city. 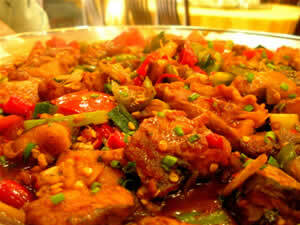 Guilin chufas can be eaten as fruit or as a vegetable. Chufas, sometimes referred to as tiger nuts in the West, are grown in Guilin and are very sweet and crispy. Chufa paste, chufa panocha and canned chufa each have their own unique flavors and will add extra zest to your cooking.